In April 2017, the consortium led by Euromot prepared the Frequently Asked Questions document providing answers to key questions that are likely to be asked by users of the EU Regulation 2016/1628 (NRMM). 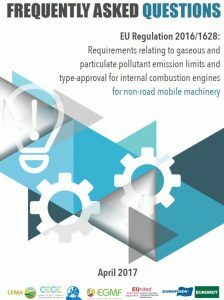 This Regulation draws requirements relating to gaseous and particulate pollutant emission limits and type-approval for internal combustion engines for non-road mobile machinery, amongst which are engines in inland waterway vessels.. Follow this link to review the NRMM FAQ Guide (or click on the picture). The EIBIP Platform is currently elaborating a dedicated guide for inland waterway transport stakeholders. In the form below you can provide question and topics that shall be included in this dedicated guide.